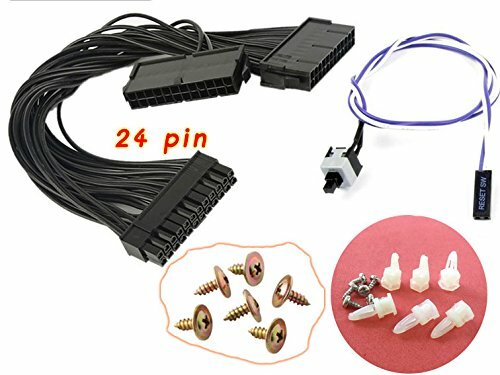 Bitcoin Miner Accessories Set 1 x Dual PSU Power Supply 24-pin Cable/1 x Reset Switch Cable/6 x GPU Screws/6 x Motherboard Insulator - Standoffs - Spacers by UgetAll at Pacs BG. Hurry! Limited time offer. Offer valid only while supplies last. 1 x Dual PSU Power Supply 24-pin Cable: 1 x Male Connector and 2 x Female Connectors # Length 11.5 inches. 1 x Reset Switch Cable / (Also Power Switch): 2-pin perfect fit for motherboard # length 22 inches. 6 x Motherboard Standoffs / Spacers / Insulator: Nylon Motherboard Standoff fir for all series of motherboard, the nylon standoff will protect your mother grounded hol for longer use than any kinds of metal standoff, come with screws easy to place on miner case. 6 x 6 x GPU Screws (Graphic Cards Screws): Bigger Head Screws, highly recommended for your GPU to place on your miner case / Screws body size 0.12", Length 0.4" and Head size 0.4". If you have any questions about this product by UgetAll, contact us by completing and submitting the form below. If you are looking for a specif part number, please include it with your message.